in the Tuebingen University library in Germany. Ah, I see Adam McLean stating "Possibly the earliest example of this emblem form." has all of the pictures and text from the book, and only says it is "aus dem beginnenden 15. Jahrhundert." I can't figure it out; are those two dates referring to the same book? What accounts for the discrepancy of dates? ... nice picture collection. But it seems he's orientated towards a scholar Hauber, who wrote 1915. Maybe modern research has made some progress. The other information with "1475" looks more solid. Apropos the items on the table, see this magician, at 5:43, and especially beginning 6:06. He sticks his tongue out. Pen wrote: Hi Marcos, glad you're back! It took me a while, but at last I found the exact ref. I was wondering why Pen thought saint James was a Hierophant figure when he looks more like the Hermit? 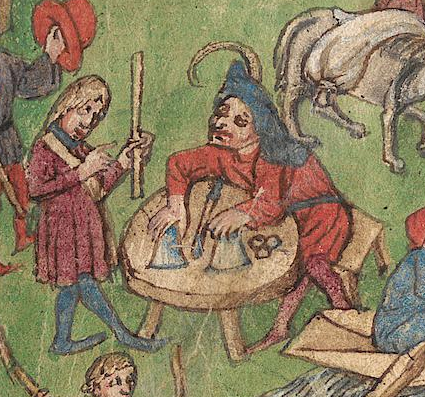 The library gives a range of production dates from 1430 to 1480, in Württemberg. What is the object between the cups? A wand? And why is the other figure holding a stick? robert wrote: Thanks for that Ross! I'm sure it's a wand. Why the other figure holding the stick? I don't know - I guess maybe he's threatening the magician in case he sees him cheating? But really, who knows? The text doesn't seem to explain the scene, or even mention it. "Mein Kind ist unbeständig wie der Mond und bleibt selten an einer Stelle, es fängt vieles an, lügt zwar gerne, verfügt aber über weise Rede, hat ein kaltes Wesen, gerne ungesund, gerät wegen kleinen Dingen in Zorn und wird ungemütlich. Ein Mond-Kind wird selten 60 Jahre alt. Lieblingsberufe sind Kaufmann, Schiffer, Läufer oder Bote. Sein Gesicht ist rund, bleich und hell, seine Stirne breit, ein Auge ist größer als das andere, es hat eine kurze Nase mit weiten Nasenlöchern, einen dicken Mund, sein Gesicht weist häufig Flecken auf; er wird frühzeitig grau und hat selten Glück." My child is inconstant as the moon and seldom remains in one place, it starts much, but lying like, but features as speech, has a cold nature, like unhealthy device because small things in anger and is uncomfortable. Moon Child is a rare 60 years old. Favorite occupations are a merchant, sailor, runner or messenger. His face is round, pale and bright, wide his forehead, one eye is bigger than the other, it has a short nose with wide nostrils, a big mouth, his face often has spots, it turns gray early and has rarely lucky. And an apology to Michael Hurst - this text explicitly makes the merchant, Kaufmann, a Child of Luna. I have previously held that the merchant is a Child of Mercury. In relation to the card, I find four things of interest. 1. Magic tricks were not just the province of low-lifes, if Leonardo da Vinci performed them for others (one of his tricks is reported in the article) and also a Franciscan monk who was a professor at various universities and an author of numerous books on mathematics and other subjects. Bossi's article also relates that a performer of magic tricks, one Jasonne da Ferrara, and his assistant (a boy) were invited into "gentlemen's houses" where Paciola was in attendance (p. 127). Bossi also states that "we can also suppose" Paciola shared his secrets with "street conjurers or court performers". So they were accepted at court. The reason it can be "supposed" are because it would have been an exchange whereby he could increase his store of tricks, and also the principles explained are those behind tricks that appear in later booklets that have survived. 2. Previously there were books explaining how to do tricks based on mathematical principles using coins and dice. This is the first book known that includes cards as well, even mentioning "trionphi". That is because theprinciples are similar, all based on quantitative considerations. It is thus like the sortilege-books, first dice and then cards, in a similar fashion. 3. The verbal patter that went with the tricks is that of the same mind-reading or seeing the cards "divined" in his mind that we are familiar with in the 19th and 20th century (an example is in the preceding article). It is the apparent use of one method to distract from and disguise the use of another. Paciola emphasizes the effect of astonishing the audience. The other article on Paciola in the book (in a part not given in Google Books, by Singmaster) even uses the term "divining" for ascertaining what another person is thinking of (p. 102); I would suppose that the Latin is the similar cognate term (as in Cicero's "De Divinatione"), but I don't know. Here is the paragraph (p. 102) by Singmaster. The first western Binary Divination- Ff. 114r-116r = Uri 256-260 = Peirani 161-162, C(apitolo). LX1X. a trovare una tnoneta jra 16 pensala (To find a coin thought of among 16)—divides 16 coins in half four times, corresponding to the value of the binary digits. Pacioli doesn't describe the second stage clearly, but Agostini makes it clear. This idea is supposed to have been common in Japan from the 14th century or earlier, but I haven't seen examples. Pacioli gives many other simple divinations, some based on the Chinese Remainder Theorem and the classic problem of divining a permutation of three items. I am not sure who Agostini is, I assume some later writer on mathematical puzzles and tricks. 4. That Leonardo was interested in magic tricks tends to show the close relationship between the art of painting and the art of the conjurer, both creating illusions for the purpose of astonishing and delighting their audience. The article relates that Paciola taught Leonardo about perspective, one method by which the painter creates the illusion of real three dimensional space in his work. It is a comparison Plato also made in The Republic, to the detriment of both.